opponents half, they have no time-handling restrictions. GK cannot play by hand ANY ball played back to them including head and chest. game in the substitution areas immediately in front of their respective benches, and a player may only enter a game after the player they are replacing has left the field. Failure to do so results in a caution and an indirect free kick is taken from where the ball was situated when the game was stopped to caution the player. A ball kicked out over the touch line (side line) by one team becomes the other teams ball. The team kicking in has 4 seconds after retrieving the ball to get it back in play or it becomes the opponent’s kick in. Defense must give 5 yards distance. The referee will give a visual count with his hand. Players taking kick ins cannot step into the field while kicking ball back into play. Goals cannot be scored from kick-ins. gets the ball. 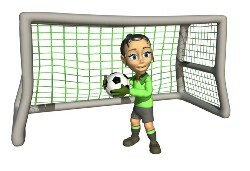 The goalie must throw the ball within 4 seconds of retrieving it and put it back into play by throwing it. The throw must leave the penalty area, but it must touch the ground on the GK’s half of the field (can’t throw ball past half-line). Opposing team must stay out of penalty area during a goal clearance. If opposing players touches ball before it leaves penalty area, GK retakes the throw. The GK cannot touch ball again until another player touches it. Slide tackling is a major foul in Futsal. It is not allowed in any situation where there is contact between players or where referees believe that contact could have resulted. the kicking team takes more time than 4 seconds to take the kick, it becomes the opposition’s indirect kick.